Over the centuries, many of Stilton’s original buildings have disappeared - often because they fell down, or had to be demolished. (Proper foundations were evidently considered an unnecessary expense!) We therefore treasure the ones that still remain and the centre of Stilton is today a Conservation Area. Here are some brief notes about our more interesting village landmarks. The numbers refer to their positions on the Stilton Trail. Erected in 1826, and fitted with a drinking cup in 1895, it was used until 1936. The surrounding area was refurbished for the Millennium and a Time Capsule buried here. Not one of our architectural treasures today, but old photographs show a rather forbidding-looking Methodist chapel standing on this corner site. Once a pub called The Wheatsheaf. More recently a youth drop-in centre but now a private house. Once home to French officer PoWs from the camp. The buildings at the rear used to be a blacksmith’s during the coaching era. Used as a Dame School in the late 1800s. 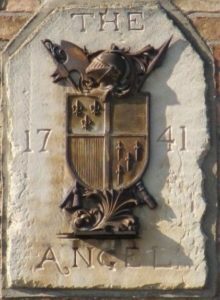 C17th. 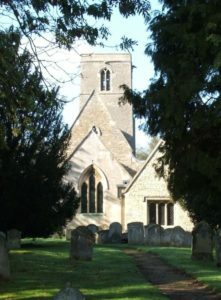 The Manor holdings date to 1086. Note the unusual arched windows. Also once a Dame School. 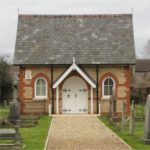 Standing in the middle of Stilton Cemetery, this picturesque building was built in 1883 as a mortuary chapel both for the deceased of the village and temporarily for casualties of accidents on the old Great North Road. Lacking proper foundations, by the late 20th century it had become dangerous, with structural cracks wide enough for a man’s hand. After careful deliberation, the Parish Council decided to have the building completely rebuilt, partly to retain one of Stilton’s most attractive landmarks but principally to provide a much-needed Parish office and relieve the congestion in the Parish Clerk’s garage! Thanks to the talents of a local architect, the new building is almost indistinguishable from its diminutive original form but is remarkably spacious inside, providing a valuable village facility. Around it in the cemetery you will find some interesting memorials. Founded in 1845, it had two classrooms, two playgrounds and an outside toilet block. The adjoining cottage (10) was formerly the Head Teacher’s house. Both are now private houses. A fine rambling house with a Collyweston roof. The paddock oak was a sapling in 1780. Opened in 1963 and later extended to meet growing demand. An excellent Playgroup and after-school club share the grounds. A former coaching inn at least 400 years old; the original archway can be seen above the larger front window. It is now a popular “local”. Look for the Stilton cheese in the stained glass window. Originally a pair of C18th timber-framed cottages. Once home to an officer from the Norman Cross PoW camp. Dedicated in 1923 as a village hall and memorial to Stilton’s war dead. Following the opening of Stilton Pavilion in 2017 it passed into private ownership. The commemorative plaque and clock are being resited elsewhere in the village. Formerly the George, and originally in the building next door! Now a popular pub/restaurant, it was once an inn for the common man – pig drovers used to pen their livestock at the rear. Both the George and the Talbot were owned by the Church until the Dissolution in the 1500's. This modest row of cottages are among the oldest remaining buildings in Stilton. An C18th stone front to a C17th house. This charming terrace of (originally) six houses was built in 1868 as a charitable bequest of Frances Worthington, the widow of William Worthington, landlord of the Angel Inn. The Charity was created to provide housing for ‘three poor men and three poor women of Stilton’. Originally each house comprised just two rooms – a living room with a curtained alcove for a bed, and a scullery. Expectations were more modest in those days! In recent years, the Trustees have carried out extensive modernisation to the buildings, which now provide snug and well-appointed accommodation for three occupants, while preserving the original architectural character. Dates back at least to 1500, probably very much older; the well in the courtyard is believed to date from Roman times. The wrought-iron sign is a modern replica of the original flamboyant sign which was so heavy that it had to have its own prop standing in the road! 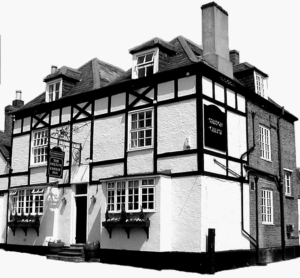 The Bell is now one of the finest inns in the country, and offers excellent food, beer and accommodation. Originally of three stories, it occupied the entire corner site and had stabling for 300 horses. It vied with the Bell for pre-eminence in the coaching era and in the early C19th was run by Miss Worthington, a redoubtable lady who also laid claim to having popularised Stilton cheese. The Angel now houses an Indian restaurant. At the rear is the popular S-Bar public house.